Two women in my extended family made it to 100 years old. One had children; the other did not. But when they celebrated their centennial birthdays, both were surrounded by loving family. The woman who had children was Ruth, my husband’s ex-mother-in-law, maternal grandmother to Fred’s children. She turned 100 last weekend. Her daughters, grandchildren, great-grandchildren and one great-great granddaughter gathered at a posh restaurant to celebrate. In the Facebook photos, she looks happy, alert and ready to go on for another decade. Although we have no direct connection these days, when Fred was around and his kids were young, we occasionally spent time with Ruth and her late husband Walt. They were always kind to me and included me as one of the family. Divorce doesn’t always dissolve the links between people; sometimes it adds more links. Ruth lives these days in a senior residence in Santa Clara, California, not too far from her family. I wish her many more happy times in her long life. The woman who did not have children was Aunt Edna, my mother’s favorite aunt, married to Mom’s Uncle Tony. I’m not sure why they didn’t have children. I have heard rumors of miscarriages and failed attempts to get pregnant. When Aunt Edna was young, people didn’t have all the medical options they have now, but they also didn’t talk about such things, so we don’t really know what happened. Aunt Edna was a whirlwind of energy, stylish, bold, and always on the go. 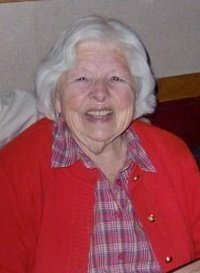 She worked in the office at a local cannery for many years. My mother worked with her until she got pregnant with me and retired to motherhood and life as a housewife. But Aunt Edna kept going. She worked, she had a busy social life, she volunteered for the church, and she loved her nieces and nephews. She was always surrounded by friends and family. Uncle Tony died relatively young of cancer, but Aunt Edna stayed in their house. Down the street, in her own house, lived her sister Virginia, who never married or had children. She too was a “career girl,” working at San Jose State most of her life. After they retired, the two sisters traveled the world, seeing just about every country. At home, they gathered with their vast network of in-laws, cousins, nieces and nephews. By the time Aunt Edna turned 100, she too was living in a senior residence, only a couple miles from where Ruth lives. Her dark hair had turned into a fluffy white cloud, her memory was fading, and she didn’t walk as well as she used to, but she was never alone. For her birthday party, the family rented a banquet room at a local restaurant and completely filled it with people who loved Edna. It was the climax of a wonderful life. Edna died a few months later. A crowd attended the funeral, among them Virginia, now in her 90s, still living in her own home with help from a caregiver. Some of us without children worry that we’ll end up alone, but we don’t have to. Even if we never have children or grandchildren or great-grandchildren, we can be like Edna and love the people we have around us and be loved by them, knowing that when we turn 100 years old, we will not be alone. Fantastic post Sue. One of my biggest fears is being alone (or should that be lonely) when I'm old. Of course anyone can be lonely/alone in old age but being childless seems to make me worry about it more. Thanks, Anon. I worry about it, too, but the truth is unless you're an absolute hermit, someone will be there. Yes someone most probably will. Even if it is a health worker, someone paid to be there. And I don't mind that. I suppose how it differs for us from people with children is that they can be pretty certain throughout their lives as to who will there. As someone who is childfree (my husband Shawn & I don't want to have kids, so we don't say childless) I have to admit I do worry about who will take care of me when I'm old. Adding to the problem is I have no siblings, so I'm also denied the chance of nieces or nephews helping take care of me. I do have a half-brother (from my dad's first marriage) who's pretty awesome and his 20-something daughter and I also keep in touch, but she and I aren't close enough that I would ever even expect her to help care for me when I'm old. The one thing that gives me hope is that like the two ladies you mentioned in this blog entry, I do have a LOT of extended family. I have some cousins (of my generation and the next-younger generation who I'm very close to, but unfortunately they live in Arizona and Colorado). They're such awesome people that they probably would help care for me, but I don't know if I'd want to impose. Then again, who knows? Maybe my husband will outlive me and I won't have to worry about any of these things. In an ideal world, he and I will both live to be very old old & then pass away within days to weeks of each other, but the idealistic rarely happens in real life. Sorry to be such a wet blanket. Thanks again for sharing yet another well-written and very personal blog entry with the rest of us. Dear Scaryshari, You are not being a wet blanket, just realistic. I honestly don't think anybody will desert you because you chose not to have children. Because I know you personally, I can say you're a lovable (sp?) person and people will help you. But even if I didn't know you, most people are not that petty.They step in to help. I hope Shawn is there to the end with you. God willing, he will be. Take care.